This essay is concerned with how shamanic knowledge is passed on. The question is particularly relevant for the areas of Siberia and Mongolia, which are the home of the Buryats and where, in recent decades, shamanism seemed to be in real danger of disappearing. Today, however, shamanic traditions are actively pursued again and may be able to survive political currents. In this article I attempt to elaborate, by reference to a Buryat initiation ritual, the different though interdependent ways in which shamanic knowledge is handed down and kept alive. The Jacob story given in Genesis is usually read within the orthodox Judaeo-Christian tradition. However, it contains themes and elements strongly suggestive of a shamanic origin. This paper considers the esÂ­sential elements of the shamanic tradition and scrutinises the story from this perspective. Such an interpretation gives many elements within the traditional account greater meaning, and some hitherto unconsidered details are revealed as highly significant. Reconstructed as a shamanic narrative, the account of Jacob’s visions, his relationships with Isaac and Laban, the matter of the mandrakes, and the encounter with the angel may all be located in a revised framework of understanding. This framework is not reductionist but offers new insights into the signifi­cance of the story; placing it within a framework of shamanic practice and healing. Such a reconceptualisation supports the suggestion that there may be a shamanic tradition within Judaism and permits the locaÂ­tion of the Jacob narrative within the conventional corpus of shamanic experience. The language shamans use in ritual, including the language of songs and chants, has been studied by western science primarily as text, in which sound has been spatialized into writing. And language has been viewed primarily as a function of physical changes in the evolution of human consciousness. Emerging paradigms suggest we look at shamanic language as communication on the physical, symbolic and subtle planes for new perspectives on the origin of language and its role in shamanism. Drawing on cymatics, metaphysics and new work in imagining rather than theorizing language, this paper addresses the spiritual function of language, a topic that has received little attention in the ethnographic and historic literature in either socio-linguistics or shamanic studies. This article discusses the etymology of the Hungarian personal name Ãlmos and the Hungarian common noun táltos ‘person with magical powers; one able to make contact with the supernatural; shaman; magician; fortune teller’. 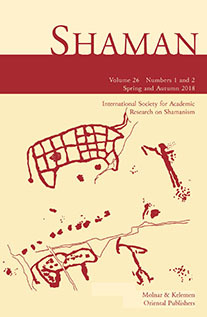 This fieldwork-based paper describes a unique Mongolian shamanic ritual of non-Mongolian-in all probability Tibetan-origin. The author, who is participating in permanent field research among the Mongolian populations of Western and Northern Mongolia, had the opportunity to observe a weather-magic ritual performed in and around the tent of Kürlää, a Western Mongolian shaman, in August 1995. One type of weather-magic ritual, performed to bring on rain, storms, etc., is well known among the nomads of Inner Asia and also among Mongolian peoples from the European Kalmyks, through the Siberian Buriats, to the settled Mongolian population of Inner Mongolian China. Analysis of the bad weather-averting rituals of the Buddhist populations of Tibet, China and India and the Western Mongolian ritual reported here enables us to investigate a complex system of multicultural contacts between Mongolian and other cultures and the religious thought of different peoples. The paper describes the ritual and presents comparative tables of the two main types of Tibetan and Mongolian weather-magic rituals. Two shaman songs were collected from a Selkup woman in the village of Ratta in the Krasnoselkup district, Russian Federation, in 1996. The first is a novice shaman’s song addressed to his or her shaman ancestor, referred to as “grandfather”, and the second song is an excerpt from a shamanic rite during which the shaman ascends to the world of the dead. The Selkup texts are provided, together with translations and commentaries. This article examines some structural features of Selkup shamanic songs at the level of the relation between the verse-form text of the song and the melody. Although preliminary, the conclusions drawn here may yield new perspectives on the general problem of versification in Samoyed languages and especially in that of the Selkup, whose musical culture is one of the least known among the native music cultures of Western Siberia. After reviewing the major scholarly theories on ancient Chinese shamanism in the first part of this study, here I explore various aspects of the Chinese religious complex to demonstrate that underlying major religious notions there was a general, pre-existing religious substratum. This substratum contains several elements for which parallels can be found in phenomena known from shamanic cultures. Therefore, the functions and attributes of the wu-the major representative of this substratum-are investigated to prove that the earliest written records of any kind of shamanic activity were written in Chinese.